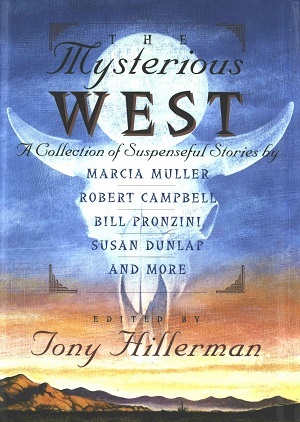 This is the first edition of The Mysterious West A collection of Suspenseful Stories by: Marcia Muller, Robert Campbell, Bill Pronzini, Susan Dunlap, and more. This 1994 edition was published by HarperCollins Publishers in New York City, New York. The cover art was completed by Wendell Minor and features the image of a bison skull with above a Southwestern landscape just as the sun rises and the moon disappears. Binding: Maroon boards with a black cloth spine and the title, editor, and publisher printed in metallic gold on the spine.